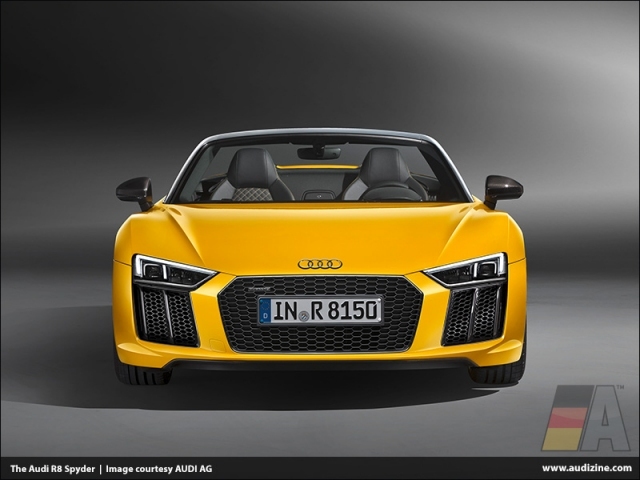 Spectacular design and breathtaking dynamism, combined with the allure of open-top driving - Audi presents the new Audi R8 Spyder at the New York International Auto Show 2016 from March 23 to April 3. 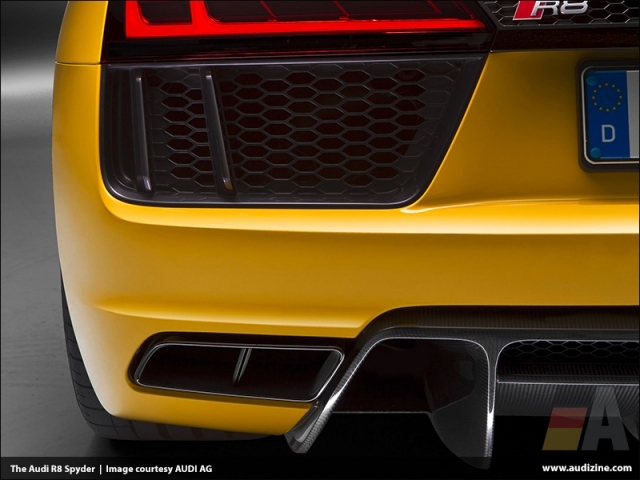 Its V10 naturally aspirated engine supplies 397 kW (540 hp) and 540 Nm (398.3 lb-ft) of torque. 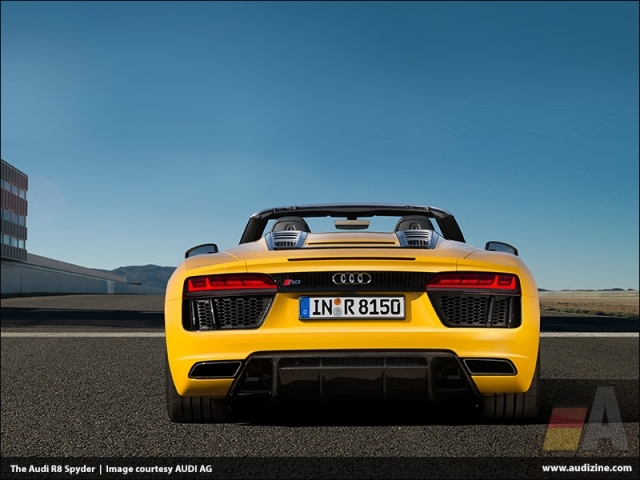 The new open-roof high-performance sports car opens another chapter in the Audi R8 success story. It all started in 2007 with the market introduction of the first-generation Coupé, followed by the Spyder in 2010. Sales of both versions combined reached nearly 27,000. They demonstrate the high-tech expertise of Audi and the brand's affinity with motorsport. The brand restates this with the second R8 generation - its engineers developed the new Audi R8 Le Mans, a GT3 racing car, in parallel with the production models. As a result, almost 50 percent of all the parts used on the R8 LMS are also to be found in the R8. The success of the new Coupé is confirmed by prestigious awards bestowed on it last year, such as the "Golden Steering Wheel" and the "Auto Trophy". "Our new R8 line is the sporty vanguard of Audi," remarked Board Member for Development Dr.-Ing. Stefan Knirsch. 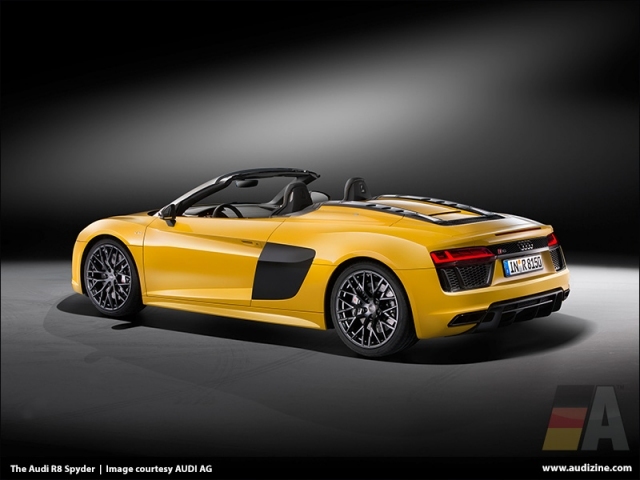 "Following on from the Coupé, we are now bringing out the second generation of the R8 Spyder. The open high-performance sports car delivers thrillingly captivating performance and gives the driver an even more direct experience of the V10 naturally aspirated engine's unmistakable sound." 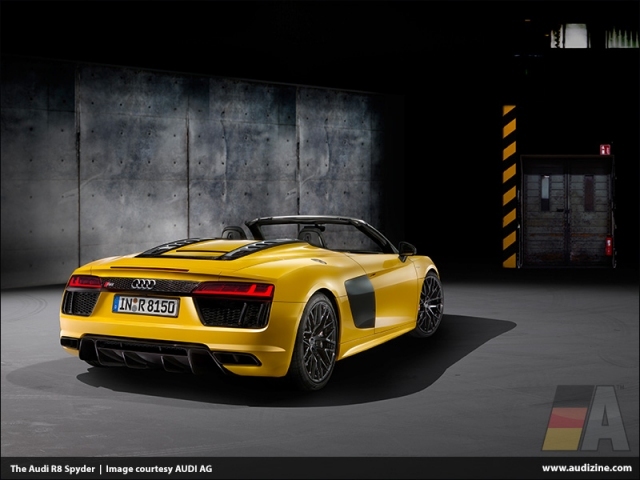 The dynamic character of the new Audi R8 Spyder V10 is immediately apparent at first glance. The forward position of the passenger compartment, the highly accentuated wheel arches and the long back define the classic silhouette of a mid-engine sports car. 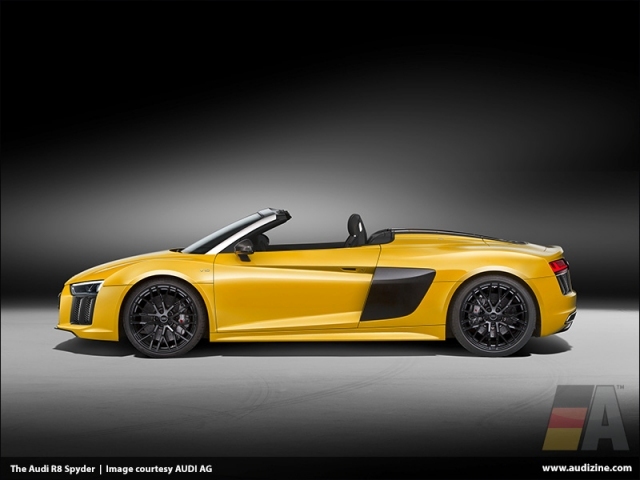 The new R8 Spyder is 14 millimeters (0.6 in) shorter than the previous model and measures an overall 4,426 millimeters (14.5 ft) in length. It has grown by 36 millimeters (1.4 in) in width to 1,940 millimeters (6.4 ft). The height of 1,244 millimeters (4.1 ft) is unchanged from the first-generation R8 Spyder, as is the wheelbase of 2,650 millimeters (8.7 ft). 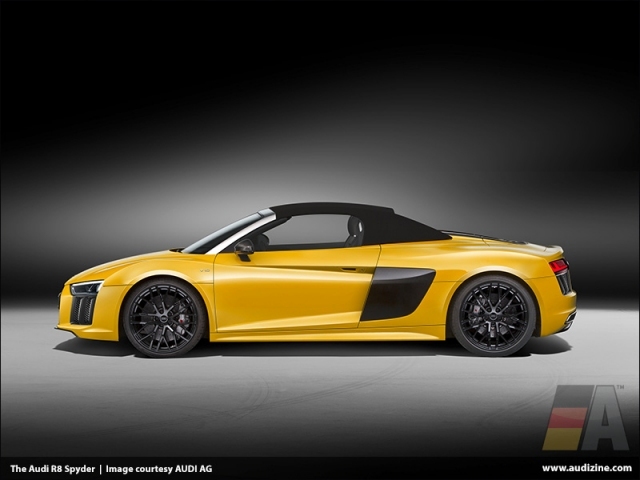 Horizontal lines at the front and rear emphasize the width of the R8 Spyder, as does the large, low-height Audi Singleframe with its radiator grille in honeycomb structure. Sculptural surfaces connect it to the wedge-shape headlights in each of which 37 light-emitting diodes generate bright LED light as standard. As a high-end option, Audi offers laser lighting for maximum visibility and range - identified by a blue anodized strip in the headlights that is additionally lit. This cutting-edge technology is combined with the dynamic indicator lights. At the rear, it is supplied as standard on all versions. The newly developed hood of the R8 Spyder is made of cloth, in typical Audi fashion. It weighs a mere 44 kilograms (97.0 lb), thus contributing to the low overall weight of this high-performance sports car. An electro-hydraulic drive opens and closes the soft top at the press of a button in just 20 seconds, and this can even be done while driving at speeds up to 50 km/h (31.1 mph). The hood module is located behind the seats. It comprises the components roll-over protection, hood, hood tray, rear-window compartment and a multiple-joint hinge for the carbon fiber reinforced, hydraulically powered hood compartment cover. The levels of road and wind noise inside the car are much lower than on the predecessor model. With the hood down, air turbulence at head level has also been reduced. There is a wind deflector made from synthetic textile for an extra boost to comfort. It reduces the reverse flow around the head by approximately 90 percent and around the shoulder/neck by 80 percent. As well as the textile wind deflector, with the hood open the rear window can act as an additional wind deflector. Whereas if it is retracted, the driver will have an even more intense experience of the V10 engine's characteristic roar. The flat storage compartment into which the hood is folded down as it opens has a large cover with three sporty ventilation slits on each side. 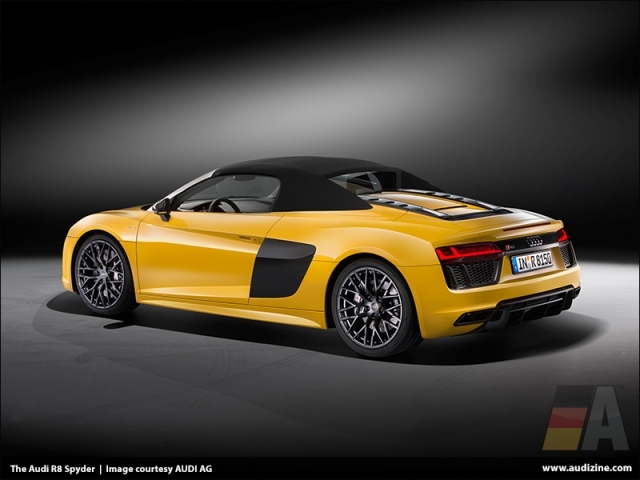 Two fins running to the rear stretch the hood and give the R8 Spyder a dynamic profile. The hood is available in three different colors: black, brown and red. 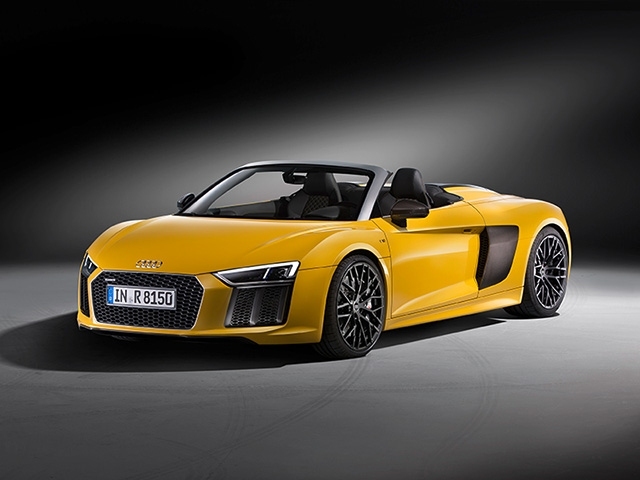 The new Audi R8 Spyder V10 impressively demonstrates the dynamic potential of lightweight automotive construction with a dry weight of 1,612 kilograms (3,553.9 lb). The power-to-weight ratio is just 3.19 kilograms (8.6 lb) per hp. The key to this outstanding figure is the new Audi Space Frame (ASF) that uses the multi-material construction principle. 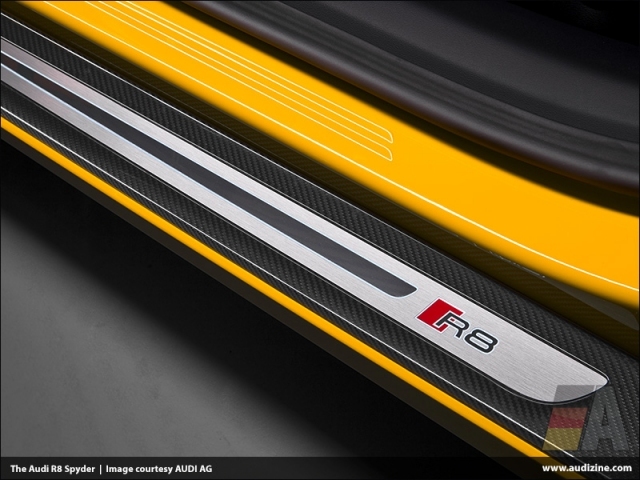 As in the R8 Coupé*, it combines aluminum components with structurally integrated carbon fiber reinforced polymer. The aluminum components make up 79.6 percent of the multi-material ASF. 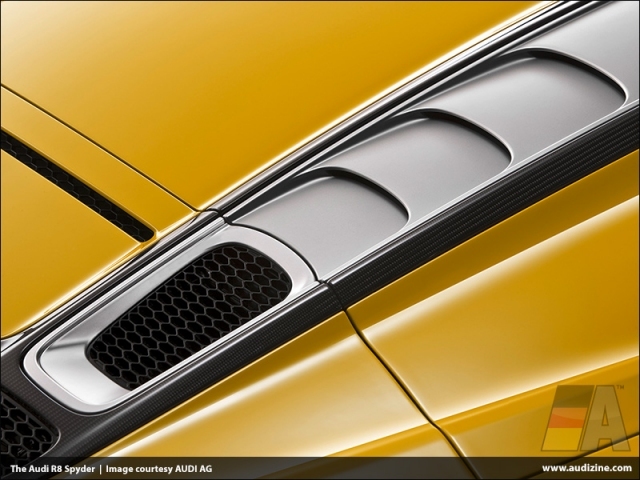 In a progression from the Coupé version, they form a lattice that Audi's engineers have used to incorporate specific reinforcements especially into the sills, A-posts and windscreen frame. Innovative manufacturing methods lower the weight of individual components by up to ten percent. 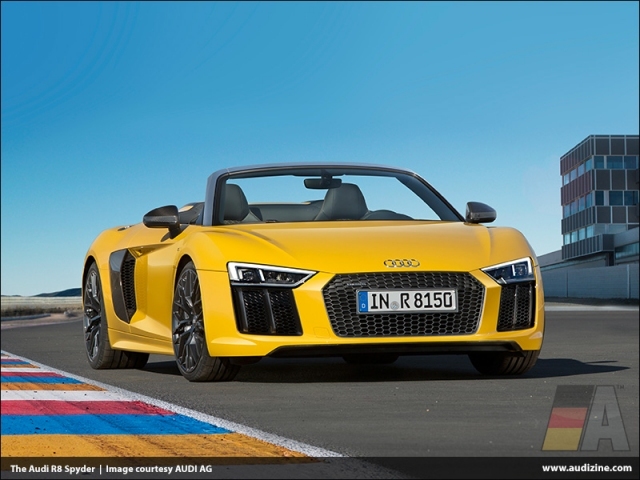 Overall, the ASF in the new Audi R8 Spyder weighs just 208 kilograms (458.6 lb); what is more, its torsional rigidity has increased by 50 percent compared with the previous model. It has achieved top marks for acoustics and crash safety, too. The underbody has a smooth trim, to improve the aerodynamics. And at the rear, a large diffuser increases the downforce - two more solutions taken directly from motorsport. With its precise throttle response, free-revving ability all the way up to 7,800 rpm and stunning sound, the ten-cylinder engine guarantees goosebumps. From its 5,204 cm3 displacement, it develops a power of 397 kW (540 hp) and a torque of 540 Nm (398.3 lb-ft) at 6,500 rpm. Along with direct injection into the combustion chambers (FSI), the V10 adds fuel injection into the induction manifold (MPI). 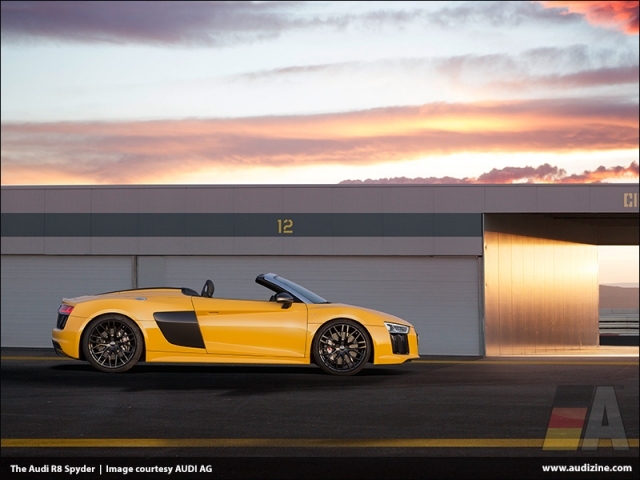 The result is captivating performance: The new Audi R8 Spyder V10 accelerates from 0 to 100 km/h (62.1 mph) in 3.6 seconds. It races from a standstill to 200 km/h (124.3 mph) in 11.8 seconds. The speedometer needle only stops rising at 318 km/h (197.6 mph). The snarl and roar of the V10 become more full-throated and passionate as the revs rise. Exhaust flaps are standard; the optional sport exhaust system with gloss black tailpipe trims gives the sound added edge. Compared with the previous model, NEDC fuel consumption has been cut by ten percent - thanks to efficiency technologies such as cylinder on demand (COD), the dual injection system and the freewheeling mode in the seven-speed S tronic dual-clutch transmission: when the driver takes their foot off the accelerator pedal at speeds over 55 km/h (34.2 mph), the engine is decoupled from the drivetrain - the new Audi R8 Spyder then coasts. It consumes on average 11.7 liters of fuel per 100 kilometers (20.1 US mpg) which corresponds to 277 grams CO2 per kilometer (445.8 g/mi). The quattro drivetrain combines three high-tech modules: The seven-speed S tronic, which is located behind the engine, changes gear with lightning speed thanks to its two clutches. There is an electro-hydraulically activated multi-plate clutch on the front wheels, an electronic-control, watercooled system that distributes the V10's torque freely between the axles. A mechanical rear differential lock is the key to sporty road behavior. Its locking values were newly tuned to work together with the actively controlled quattro drive. The driving dynamics control for the quattro drive is integrated into the Audi drive select system, which offers the four modes comfort, auto, dynamic and individual. In each of these, the open-top high-performance sports car displays a different character ranging from effortless autobahn cruising to a style that savors every bend on a mountain pass. The system also draws on the accelerator characteristic, the steering, the S tronic, the exhaust flap control function and the optional adaptive damping system Audi magnetic ride. The car's handling becomes even more accomplished and precise with the optional performance leather steering wheel, which makes its debut in the R8 Spyder. It adds three more driving programs: dry, wet and snow. Because each mode has its own specific friction parameters, the driver can adapt their R8 Spyder individually to the prevailing conditions of the road being traveled. As well as the above technical modules, the ESC stabilization control system also influences these modes. The R8 Spyder owes its decidedly dynamic handling among other factors to the low installed position of the engine, which is achieved thanks to dry sump lubrication. The wheels are controlled by lightweight aluminum wishbones - a layout that reveals motorsport DNA. The electromechanical power steering provides excellent road contact thanks to its subtly differentiated feedback. Alternatively dynamic steering is available. It changes the ratio as a function of speed, while adapting the steering torque to suit. The result is an even more precise steering feel and enhanced ride comfort. 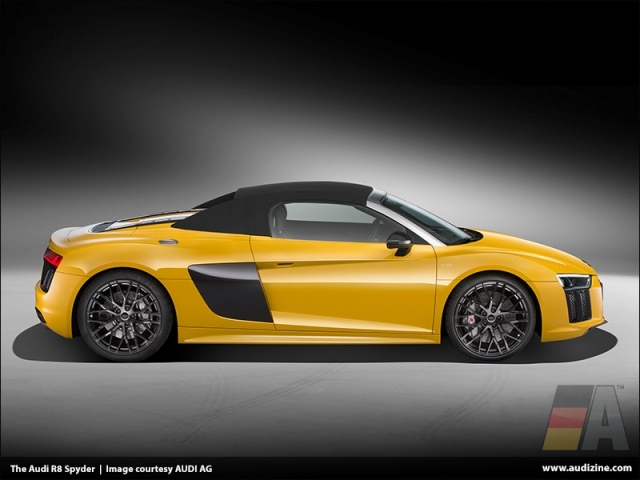 Audi supplies the new R8 Spyder as standard with 19-inch wheels with a mix of tires (245/35 at front and 295/35 at rear). There is the option of 20-inch wheels with size 245/30 tires at the front and 305/30 tires at the rear. The brakes provide supremely controlled retardation for the open-top high-performance sports car. The calipers are each fitted with eight pistons on the front wheels, and four on the rear wheels. Large, ventilated and perforated wave-design discs are used all round. As an equipment option, Audi can also supply extra-durable, lightweight brake discs made from carbon fiber reinforced ceramic material capable of handling especially high loads. 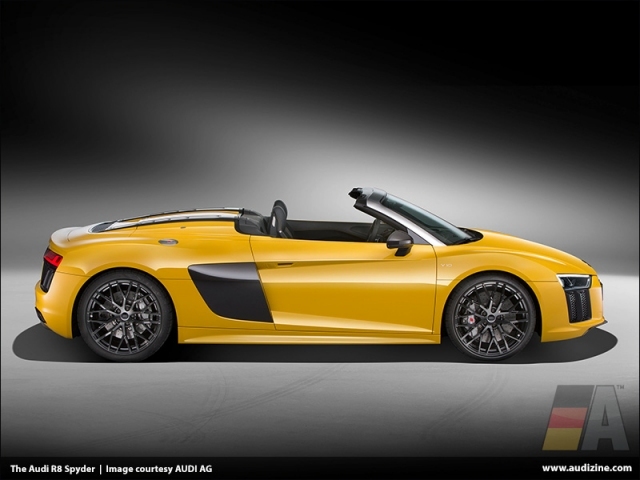 The operating concept of the new Audi R8 Spyder V10 focuses consistently on the driver, as in a racing car. The driver can control all important functions from the new sport or performance leather steering wheel. Their hands remain on the steering wheel so that they can concentrate fully on the road. Standard features include satellite buttons for starting and stopping the engine, and for the driving dynamics system Audi drive select. The performance leather steering wheel comes with two additional control satellites - one for the performance mode, and one for the exhaust flap control. The standard Audi virtual cockpit presents all information in richly detailed, high-resolution 3D graphics on a 12.3-inch monitor. The driver can choose between three screens - the classic view, the infotainment view and the performance view. Ambitious drivers taking to the racetrack will particularly appreciate the latter, which supplies data on torque, power output, oil and tire temperatures, lap times and g-forces The displays around the speedometer and rev counter can be customized to individual preferences. MMI navigation plus with MMI touch is standard equipment in the R8 Spyder. As with a smartphone, its control features are structured in flat hierarchies, including a free text search function. Vehicle functions can be controlled from the steering wheel, the MMI terminal on the console of the center tunnel or by natural-language voice control. The latter is especially convenient and delivers high-quality results thanks to three small microphones in the belts. 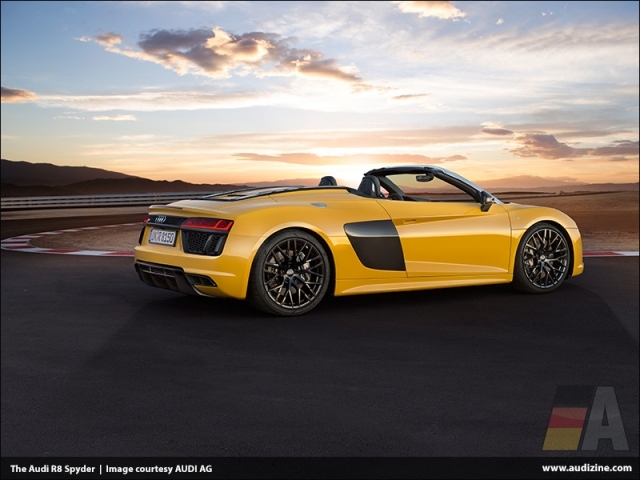 They are standard in the R8 Spyder. The perfect counterpart to MMI navigation plus is the Audi connect module, which gets the open two-seater on the Internet via LTE and gives access to a wide range of services. These extend from navigation with Google Earth and Google Street View to online media streaming and real-time traffic information. Inductive smartphone charging via Audi phone box is available as an option. 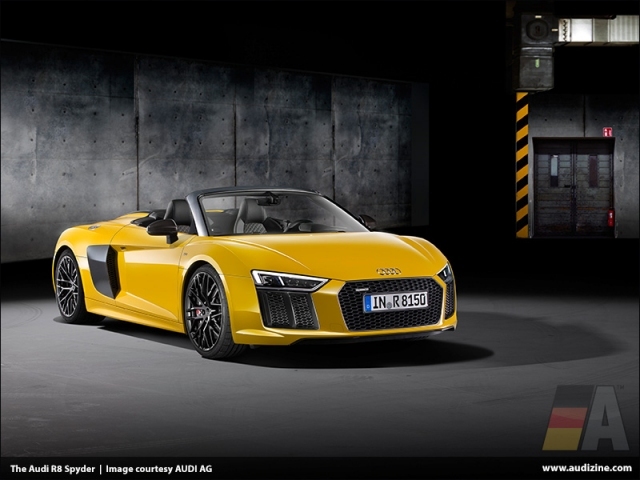 The Audi R8 Spyder is the first model on which selected mobile phone content can also be displayed directly in the Audi virtual cockpit via the Audi smartphone interface. From the middle of this year, this option will also be available for the R8 Coupé. One highlight for audio enthusiasts is the Bang & Olufsen Sound System with 13 loudspeakers, including the new head-restraint loudspeakers. There are two of these in each seat, positioned at ear level of the driver and passenger; they are notable for their excellent sound and low weight. 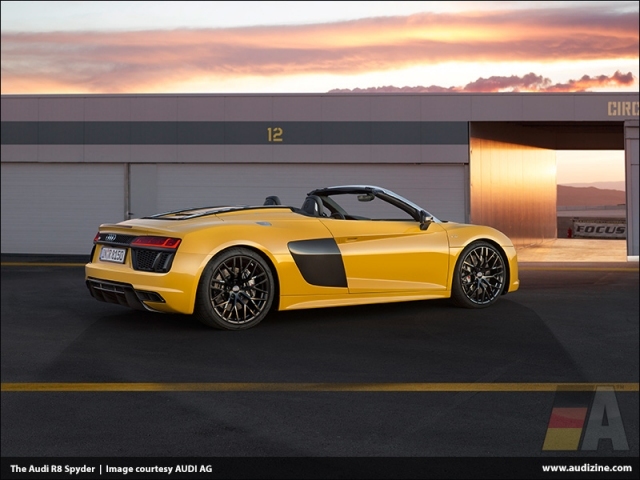 The Audi R8 Spyder V10 is almost entirely hand-built at the "Audi Böllinger Höfe" purpose-made production plant near Neckarsulm. quattro GmbH is steadily building up its expertise in small production runs there. The manufactory character of the production operations affords ample scope to accommodate specific customer requests. The sport seats for driver and passenger come as standard - upholstered in exquisite diamond-pattern leather as an option. Alternatively Audi can supply bucket seats for even better lateral support. 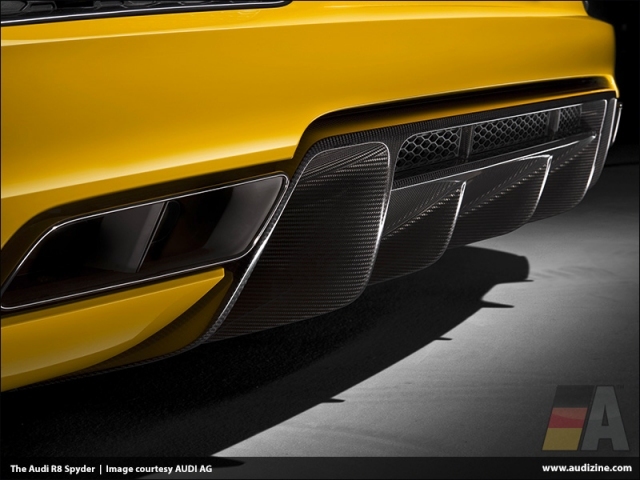 Add-on body components such as the front spoiler, diffuser or the new, striking sideblades can be customized, for instance in high-gloss carbon fiber. Another element that is both a technical innovation and provides visual differentiation is the optional Audi laser lighting with anodized blue strip. An entirely new color is available especially for the R8 Spyder, Argus brown, matt, along with ten other paint finishes.